Along with other military exercises associated with its Gulf Operation, it is now behind ensuring tainted Gulf seafood is consumed nationally according to WDSU news today. Dr. Rodney Soto and environmental attorney, Stuart Smith are among those continuing to advise that Gulf seafood is not safe. Dr, Soto has stated that Gulf seafood is the primary way the plague now afflicting Gulf residents will spread throughout the nation. Who to trust: seafood sniffers, military or doctors and attorneys watching people suffer and die? Dr. Soto and attorney Smith would know lethality of Gulf seafood. They see patients and clients daily, many now dying. Stuart Smith has been conducting his own tests. Dr. Russell Blaylock has warned about seafood contamination. The military, on the other hand, is not known for saving lives. Historically, it has been involved in not only the killing machine, but also non-consensual human experimentation. New Orleans environmental attorney Stuart Smith has proven that Gulf seafood is a danger to public health, contradicting government assurances that eating the catches since the Gulf oil "spill" is safe. Tuesday night on the Rense Radio Network's special on the Gulf, Dr. Soto again highlighted in his presentation that Gulf seafood is not safe for anyone. In the WDSU report, Military To Serve Gulf Seafood Nationwide, Louisiana's Delicacies Head To Armed Services Kitchens, the question raised is, "But why the military, and why now?" "Well, because they are a huge customer ... not withstanding the fact that they're trying to provide good, tasty food for soldiers and sailors and airmen, and that it's healthy and all that kind of stuff," Flynn said. With existing evidence through research by Michael Edward of the synthetic, DNA changing, antibiotic resistant bacteria injected into the Gulf, the military is again a prime cohort to test Gulf Frankenfood. As Mr. Edward stated on the Rense special, "While natural viruses and bacteria respect species barriers, the storm of artificial genetics created by synthetic biology engineers to eliminate the flow of crude oil and gas in the Gulf of Mexico, are actually designed to cross species barriers. This has created new viral and bacterial pathogens never seen before. "It’s directly responsible for the spreading of antibiotic resistant viral and bacterial outbreaks along the Gulf Coast, a pestilence that I named The Gulf Blue Plague." Organizers of the military Gulf seafood consumption effort, according to WDSU, "said this is a great way to show that the food is good to eat." "We want to help get the message out, but more importantly, we want to share this with our military families," said Chris Laborde of the Gulf Seafood Alliance. With military might, now the same Blue Plague can better reach dinner tables across America. 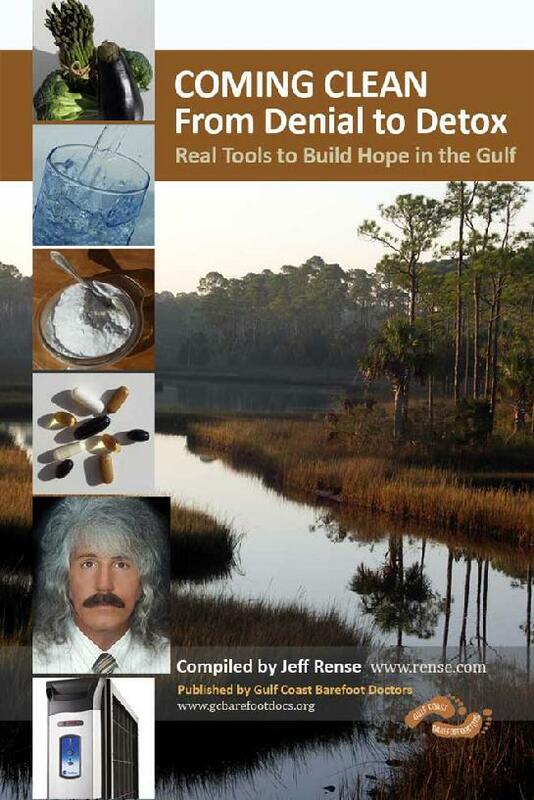 Learn more about Gulf seafood and how to survive the Gulf plague by downloading on his home page Jeff Rense's free ebook, Coming Clean, From Denial to Detox: Real Tools to Build Hope in the Gulf. Copyright Deborah Dupre, Examiner 2011. All rights reserved. Deborah Dupré, B.S., M.S., DipContEd, QMHP from U.S. and Australian universities, has been a human and environmental rights advocate over 25 years in U.S., Vanuatu and Australia. Support her work by subscribing to her articles and forwarding the link of this article to friends and colleagues or reposting only title and first paragraph linked to this Examiner page. Email info@DeborahDupre.com. Send targeting and Gulf illness news tips to her with your name or anonymously. See her Vaccine Liberty or Death book plus Compassion Film Project DVDs at www.DeborahDupre.com. For the first time since the deadly April 2010 Gulf of Mexico operation, a host of Gulf of Mexico region heroes are slated to speak truth to the nation and the world Tuesday, 1st of February, 7-10 PM Pacific Time thanks to the humanitarian, Jeff Rense hosting a three hour radio special, Voices From The Shattered Gulf. The program will be broadcasted live, nationally and internationally in defiance of mainstream media cover-up of the ongoing and worsening catastrophe and resulting public health decline including already surging cancer.